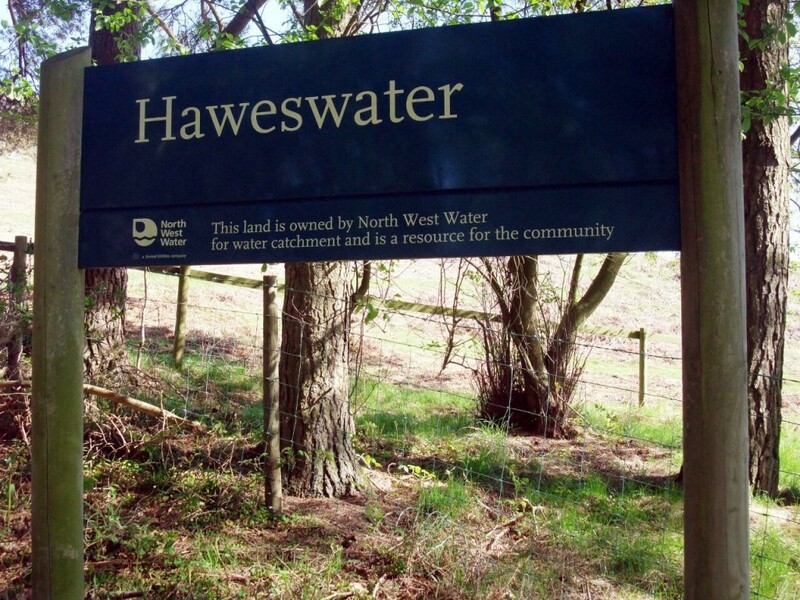 The North West Water sign at the eastern end of Haweswater in Cumbria is loaded with significance. “This land is owned by North West Water for water catchment and is a resource for the community,” the sign proclaims, without saying one of the communities benefiting from it is 90 miles away. In 1935 the city of Manchester needed water, so the village of Mardale Green on the eastern edge of the Lake District was sacrificed. Its hundred or so residents were evicted and their houses destroyed, including a school and a pub, the Dun Bull Inn. The church was dismantled and its stones were used to build a dam. Corpses were exhumed from the graveyard and re-interred at Shap a few miles away. The valley was flooded and the lake of Haweswater created to supply water to Manchester and other towns in Lancashire. In periods of drought, like in 2003 and 2010, the ghostly town sometimes emerges out of the water, which must seem a bit weird. I imagine it was pretty shocking at the time, but 80 years later only a fool would let it spoil their enjoyment of a very pleasant Lakeland walk. The footpath which runs the entire length of its northern shore forms part of Alfred Wainwright’s 182 mile Coast to Coast Walk. 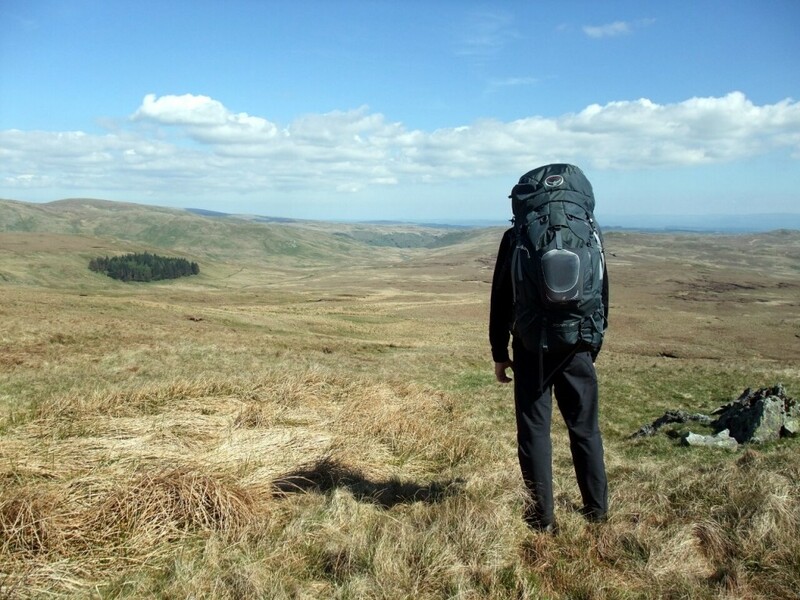 It was glorious weather when I strapped on my rucksack and headed along the path at the start of a two day backpacking adventure (or more specifically, microadventure). Although the amount of water taken from Haweswater in a year is equivalent to 60 seconds of water travelling over the Niagara Falls (a useless fact kindly supplied by the BBC), they did a pretty thorough job of flooding the valley, and hills rise steeply on both sides pretty much straight from its shores. At the far end I could see the whaleback of Harter Fell curving gently across the horizon, a hill I would be climbing later in the day. It took me nearly two hours to walk the length of Haweswater from east to west, and although I was on part of the Coast to Coast Walk I only saw a couple of other walkers. At the far end I crossed over Bowderthwaite Bridge, a small wooden footbridge beneath the wide grassy amphitheatre of Riggindale. I was now just a short hike from the car park at Mardale Head on the southernmost tip of Haweswater, and there were a lot more people. A group of elderly Geordies watched me take a photograph across the lake, and were surprised at the size of my pack. “Well, two days’ worth, anyway,” I replied. They roared with laughter. It wasn’t even supposed to be a joke. From The Rigg, a wooded peninsula jutting out into Haweswater, a enjoyable rambling ridge called Riggindale Crag leads up to High Street in a series of easy scrambles and short flat sections. High Street is the highest hill in the Eastern Lake District, and is a long broad plateau which was once an old Roman road, hence its name. It’s still known on maps as Racecourse Hill after a summer fair which used to be held there in the 18th and 19th centuries. Wrestling and horse racing took place and stray sheep were apparently returned to their owners, though how the sheep knew to gather on this particular hilltop every July to be reunited with shepherds is a mystery. Halfway up Riggindale Crag I looked down and saw the deep blue lake of Blea Water nestling in a hanging corrie 300 metres above the valley floor. 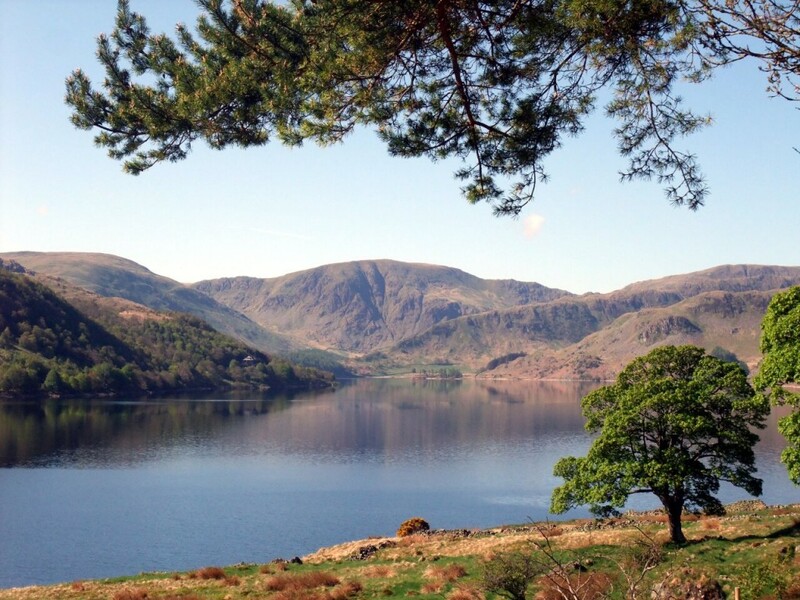 David Craig contrasts the natural lakes of Blea Water and nearby Small Water with the vast reservoir of Haweswater by describing the former as “cupped as beautifully as raindrops in the calyx of a flower,” which is pleasingly poetic, but not much use unless you know what a calyx is. It was certainly beautiful to look at, with Harter Fell sleeping on the horizon beyond. High Street feels more like a giant field than the top of a hill. A dry stone wall has been built all along its length, and its summit is as flat as Bob Dylan singing Gregorian chants at an Irish karaoke bar. 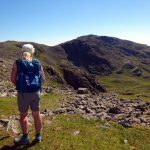 The view to the east is dramatic though, and particularly appealing if you’ve climbed a few Lake District peaks and enjoy the challenge of identifying them. In the far distance the high Cumbrian fells of Sca Fell and Scafell Pike, the highest point in England, are split by the deep cleft of Mickedore. To their right the prominent dome of Great Gable stands alone on the horizon. 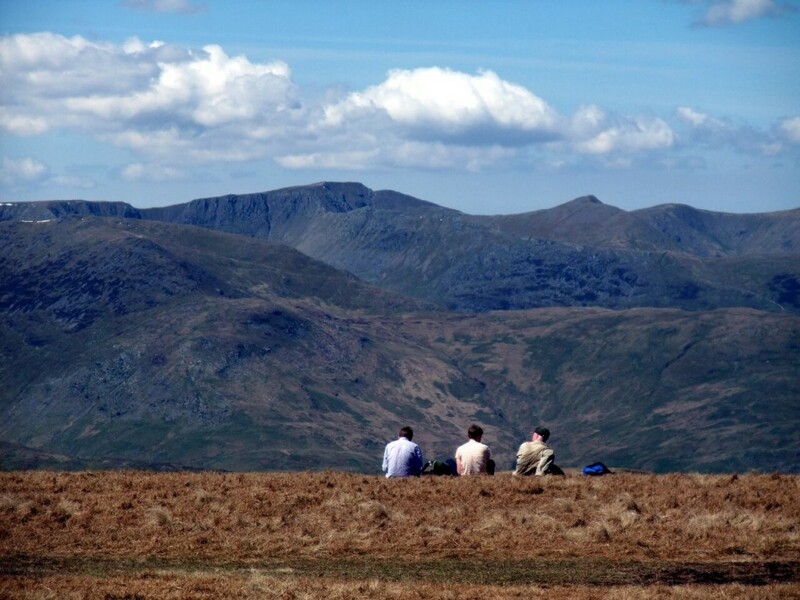 Closer at hand are the central fells: Fairfield, Dollywaggon Pike, Helvellyn and Raise. A group of walkers were sitting on the plateau contemplating the knife edge of Striding Edge scything down from Helvellyn. I took a quick self-portrait mug shot at the summit trig point before curling southeastwards across wide grasslands down the broad ridge of Mardale Ill Bell. There were plenty of other walkers here, but I found a quiet spot in the lush grass beyond the summit where I could sit back and look out across the now distant Haweswater far below after nearly five hours of non-stop walking. A couple of ham sandwiches later it was easy for me to drop off for a half hour nap in the hot sun. 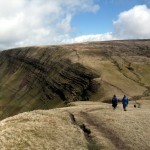 In the afternoon I dropped down the ridge to a crossing of footpaths at the Nan Bield Pass, and up the other side. It was starting to cloud over, but it didn’t take me long to climb back up to the long grassy summit of Harter Fell. I was off the beaten track and away from the crowds now, and as I descended the other side to another col, the Gatescarth Pass, I could see the bare valley of Mosedale beyond, a striking contrast to Mardale and the deep blue of Haweswater. 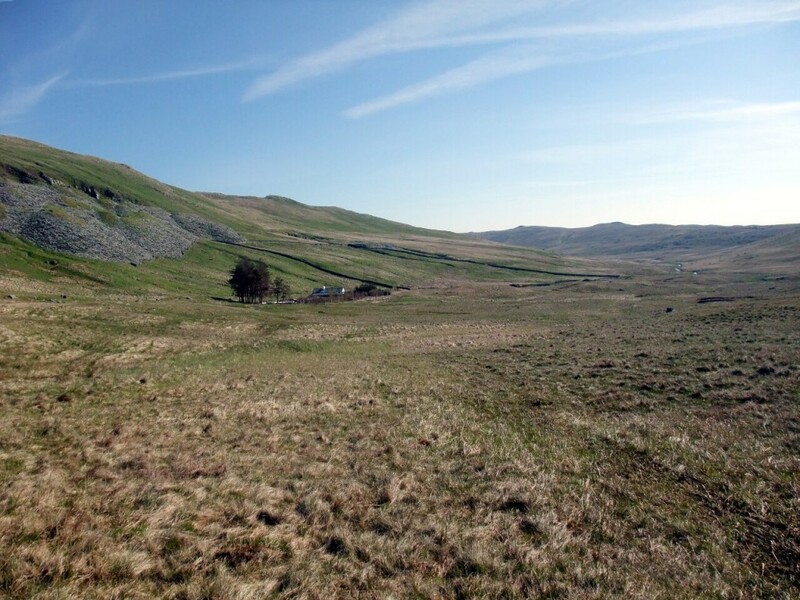 Mosedale is a windswept and treeless boggy grassland, but also a suitable location for a peaceful wild camp, away from the main walking trails. Or so I thought. It is also home to Mosedale Cottage, a substantial whitewashed old shepherd’s cottage which has been converted into a bothy by the Mountain Bothies Association. Bothies are old barns and huts without facilities that have been converted into overnight accommodation for hikers. They are good in theory, if you’re lucky enough to have one to yourself, but after a long day with a pack on my back I prefer the solitude of my tent to a night with strangers, so I walked a little beyond it and pitched up in the thick grass beside Mosedale Beck. Call me a miserable old cantankerous unsociable hermit if you like, and fair enough, but I don’t care. Shortly after I settled into my sleeping bag and roared my stove into life I heard the buzz of quad bikes zooming past in the fields above me, and could only imagine that some sort of party must be going on inside Mosedale Cottage. Give me two mugs of piping hot Earl Grey tea in a cosy tent over a crate of home brew in a damp barn any day. 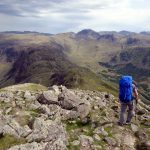 The following day I climbed up onto the grassy moors above Mosedale’s southern boundary and avoided paths altogether for four hours as I explored miles of grassy hillsides. I had the moors to myself, and although the hills were not as dramatic as those of the previous day, I was right on the edge of Cumbria’s highlands, and could see for dozens of miles across to the Pennines on the far horizon. One of the unusual things about the Lake District that never ceases to surprise me when I stroll across it with an Ordnance Survey map, is how some of the remotest, most innocuous features seem to have names that might have been invented by Lewis Carroll on one of those mornings when he was still drunk from the night before. Ulthwaite Rigg is proclaimed in large letters as the most prominent peak for some distance, but when I got there I almost tripped over it. I don’t even know what a rigg (with two Gs) is anyway. Scam Matthew sounds like a shady character who is best friends with the Artful Dodger, but is in fact a small hill, more aptly found in nearby Crookdale rather than Swindale, where it actually is. Lawyer’s Brow is more appropriately positioned as far away from everything else as it’s possible to be (with apologies to any lawyers reading, but somebody was going to say it so it might as well be me). Wet Sleddale sounds like a slushy activity I used to do on a winter’s day in the fields behind my home as a small child, and Lunch House appeared to be positioned a little too close to Grouse Butts to make for a pleasant meal. Ewe Close is a popular instruction in New Zealand, and the Fewling Stones didn’t appear to be doing as much fewling as they might have been. I tried not to think about how Robert’s Seat came to be found so close to Willy Winder Hill, but after an enjoyable morning ramble over hills, across peat bogs and grasslands I found myself atop Trussgap Brow looking down into Swindale Bottom. Swindale was the third valley of my weekend and was another great contrast to the watery Mardale and bleak Mosedale. 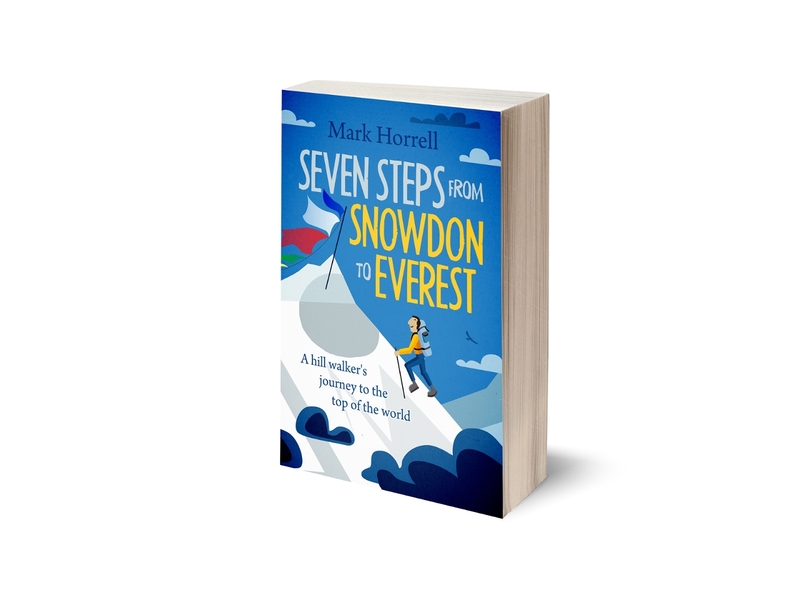 I sat on top of a rocky crag, with a pleasant green valley of isolated farms below me. Bright yellow specks of gorse bush provided splashes of colour, and it was a fine place to stop for a sandwich. 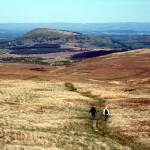 It took me less than an hour to descend into Swindale and walk along a quiet country lane. I had another short climb up and over moorland before dropping back down into the eastern end of Mardale, where my car was parked beside the road a short distance from Haweswater dam. It’s been a cold and miserable spring here in the UK, but I had enjoyed a virtually cloud free weekend and was almost sunburned. Summer is nearly upon us. Here’s a short video panorama of the view up Riggindale Crag and across Haweswater from The Rigg, and you can see the rest of my photos from the weekend here.